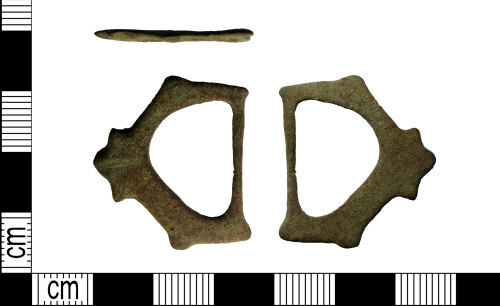 Early Medieval / Medieval copper alloy buckle, Length: 28 mm, width: 25 mm, thickness: 2 mm, weight: 3.13 g.
The buckle is sub rectangular in form and rectangular in cross section. It is five sided externally and has a D shaped internal void. It has a narrow offset pin bar and its sides have angled projections with slightly rounded knops. It has a central projecting tri-lobed pin rest which has incised depressions divided each lobe. Its frame has very worn traces of a dot in ring motif. The buckles decoration is devolved 'Ringerike' and based on examples such as GLO-20D4FE Two very similar buckles can be seen here BH-82CF20 and SWYOR-22FFC7. A copper alloy rectangular double looped buckle frame. It has tri-lobed outer edges. The bar is offset.